Colour-composite image of the planetary nebula NGC 1514 obtained from narrowband Halpha+[N II] and [OIII] images taken using the Wide Field Camera (WFC) on the Isaac Newton Telescope (INT). Credit: David Jones (Instituto de Astrofisica de Canarias) [ JPEG ]. 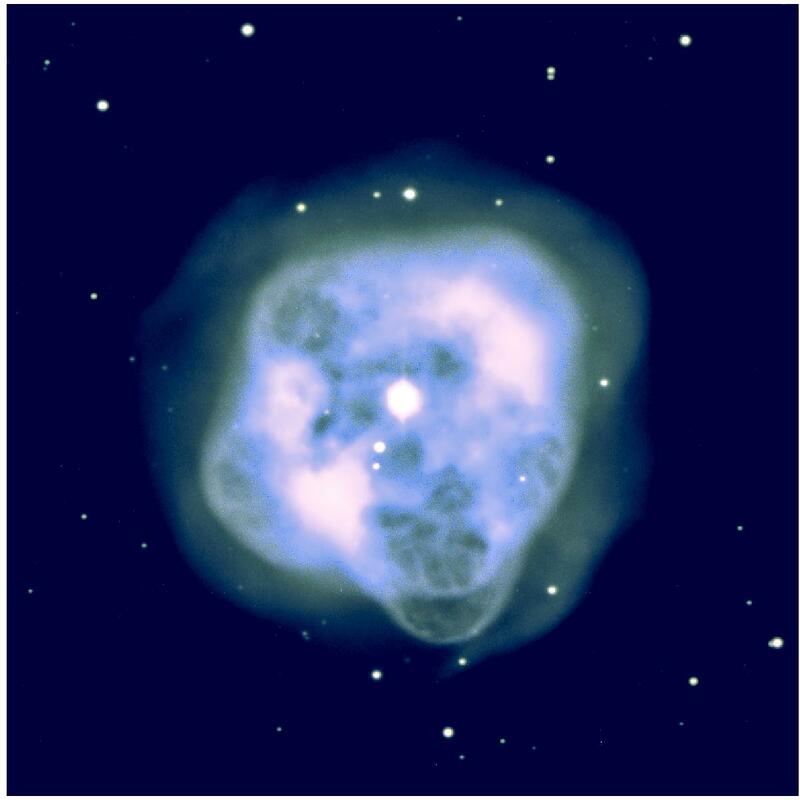 Planetary nebulae are believed to represent the fate of all Sun-like stars; as the star evolves it sheds its outers layers in the form of a dense stellar wind which is then ionised to form the glowing shell of the planetary nebula. It has become apparent that the wide array of shapes found in planetary nebulae are difficult to understand in a single star scenario. The interaction between a dying star and a companion star in a very close orbit (generally with an orbital period as short as a few hours to a few days) is the preferred mechanism for forming strongly aspherical morphologies. Researchers from the Instituto de Astrofísica de Canarias (IAC), Spain and KU Leuven, Belgium have demonstrated that the star at the centre of NGC1514 has a binary companion orbiting roughly once every nine years—the longest orbital period known in a planetary nebula—demonstrating that even binaries with very long periods can play an important role in the shaping of their planetary nebulae. D. Jones, H. Van Winckel, A. Aller, K. Exter and O. De Marco, 2017, "The long-period binary central stars of the planetary nebulae NGC 1514 and LoTr 5", A&A, 600, L9 [ Paper ]. The longest stellar "dance" in a planetary nebula. IAC press release, 04 April 2017.